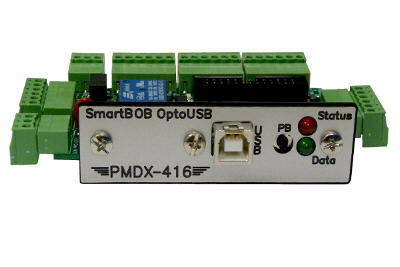 with opto-isolated inputs, and support for one encoder and one on board relay. 4) Power is supplied via the USB connection. 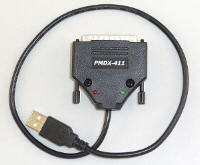 Power from the USB port is made available on J2 and J7 to power light loads such as an encoder, sensors or the PMDX-104 relay board. 5) The machine interface provides equivalent signals to one parallel port including 8 step and direction signals, 5 input signals including one dedicated to emergency stop, 4 output signals and 1 relay. 6) The machine interface is available as pluggable screw terminal connectors. 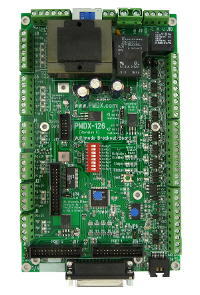 Motor outputs are also available on a 26 pin ribbon header. It is possible to use the terminal strips for limit and home switches while using the ribbon header to connect to a stepper driver or motherboard such as the PMDX-134 and a spindle controller such as the PMDX-407. 7) Five (5) input signals are opto-isolated and have a pull-up resistor to allow use with simple mechanical switches or three-wire NPN proximity switches. These signals are filtered to reduce noise sensitivity. The inputs will also accept 5 volt logic signals. 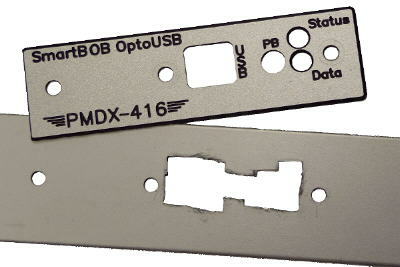 The use of PNP proximity switches will require external adaptation using a PMDX-105 or similar. All inputs are protected against voltages up to 50 volts above ground. 8) Three (3) additional non-isolated inputs are available for use as general purpose inputs, or as an encoder with index. These inputs can support a general purpose MPG, spindle index for RPM sensing and single pulse per revolution lathe threading, or full multi-line encoder support for threading. 9) The step and direction outputs are 5 volt logic signals with up to 24 mA of drive current available. The "common" connection for the step and direction outputs is selectable via the Mach4 plug-in setup to be either Ground or +5 volts. 10) The 4 logic level outputs are 5 volt signals with up to 24 mA of drive current available. These signals can be used to drive solid state relays or the PMDX-104 light duty 4 channel relay board. 11) One relay output is provided with both normally open and normally closed contacts rated for up to 10 amperes at up to 240 VAC. The normally open contacts are equipped with an arc suppression snubber for longer contact life. An LED is provided to show when the relay is activated. 14) An LED is provided for "Enabled" to indicate that the unit is ready to run the machine and as an aid in troubleshooting. There is also a "Steps" LED to indicate that motion is in process. 15) The board can be mounted against a panel with holes to allow access to the USB jack, pushbutton, and status LEDs. Right angle brackets are provided to support the board directly from the panel. A small overlay panel is provided so that only a rectangular hole and 4 screw holes are need for mounting to a panel. The board also has 4 holes for mounting using conventional standoffs. 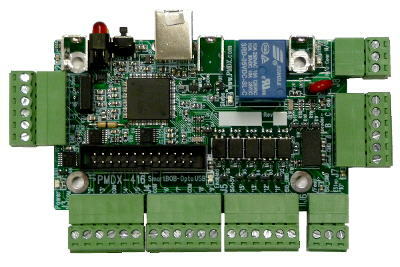 18) The PMDX-416 is a compact 2.2" by 3.75" board that fits in tight spaces. It can be self-supported when attached to a panel, or it can be mounted to an internal plate using standoffs. A dress plate is provided with each unit for use when attached directly to a panel. 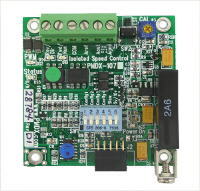 PLEASE NOTE: The available step and direction signal pinouts work with most common breakout boards and with the PMDX-340 and Geckodrive G540, but they are not totally assignable at random. If you plan to use the ribbon header outputs for step and direction signals, please verify that your device is compatible before purchasing. Available configurations are Step on pins 2, 4, 6, 8 and Direction on pins 3, 5, 7, 9 <<OR>> Step on pins 3, 5, 7, 9 and Direction on pins 2, 4, 6, 8. 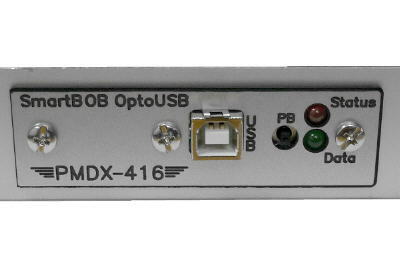 PMDX-416-BUNDLE>> SmartBOB-OptoUSB bundled with Mach4 Hobby. Software, coupon for license file, and documentation are delivered by e-mail and web download only. No physical disks or manuals are supplied.